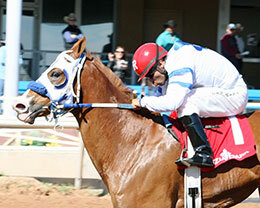 Regards Miracle, under jockey Esgar Ramirez, got up in the opening race to win the $140,000 New Mexico Classic 870 Championship at Zia Park. HOBBS, NM—NOVEMBER 4, 2018—Regards Miracle won his fourth career race and first career stakes race in the $140,000 New Mexico Classic Cup Stakes at Zia on Sunday afternoon. The stakes race, the first on the card, was restricted to New Mexico bred Quarter Horses, 3-year-olds and up, at 870 yards. The final time was 45.665 and gave the winner a 95 speed index. Regards Miracle ($4.60) was ridden by Esgar Ramirez for trainer Michael Joiner. The 4-year-old gelding is owned by Joe Dee Brooks, Ted Rushing, Scott Bryant and R. Lee Lewis. The son of Chicks Regard was bred in New Mexico by Richard Franco, out of Old Lady Mitchell, by Dean Miracle. The win was his fourth in 14 starts, and it was his second win in four attempts at 870 yards. 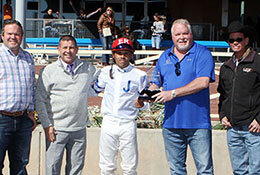 He made his first appearance around the hook in July in the Zia 870-yard Championship at Ruidoso, finishing fourth, but returned to win an 870-yard allowance at Ruidoso on Labor Day weekend. With the win on Sunday, Regards Miracle now has career earnings of $153,890. Regards Miracle was second early in the race to Amsterdams Big Daddy, who finished three-quarters of a length behind the winner in second place. J.J. Gonzales trains the 3-year-old gray gelding for owner Joe Johnson. He was bred in New Mexico by Shearer Racing, by Big Daddy Cartel, out of Amsterdam, by Tres Seis. This was the tenth career start for Amsterdams Big Daddy and only his second at the 870-yard distance. His most recent start prior to Sunday’s stake was an allowance win at Zia at 870 yards. Sunday’s race was his second lifetime stakes appearance; he qualified for the $190,000 Zia Derby (RG2) at Ruidoso in July. A neck behind Amsterdams Big Daddy was How Bout Dat and Alejandro Medillin in third place. How Bout Dat is a 4-year-old gelding who has made 13 of his 17 career starts at this distance, with two wins and over $40,000 in earnings. How Bout Dat is trained by Adam Archuleta for owner Leann Archuleta. He was bred by Sarah Donaldson Rioux, by Coronas Blackdiamond and out of the Thoroughbred mare Magic Yard, by Ghazi. Completing the field were Dark Brook, D E Wagons Strawfly, Tag Yur It, Dm Nate Dog and Desierto Famoso. Oraale (AE) and Super Quintos (AE) were scratched.